Tomodachi is a Japanese word meaning "friends." 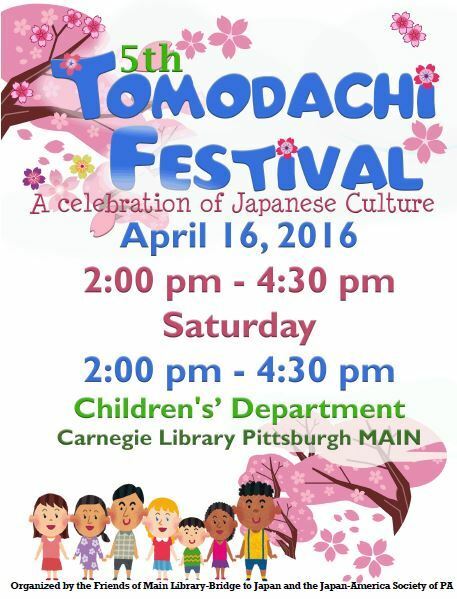 Help us celebrate the spirit of friendship through activities, art and treats that showcase Japan, its people and its rich history. Activities include origami, kamishibai theater storytelling, music and dancing, chopsticks practice and kimono try-on. Please use Carnegie Art Museum Parking and take a ticket when you enter. Your parking validation will be provided on the day at the children's department. the parking entrance is right next to the Carnegie Art Museum on Forbes and South Craig.